Deputy Features & Opinion Editor, Hannah Kingston, was honored with the opportunity to speak to Mrs. Joan Freeman, the founder of the amazing Pieta House establishment, who is as endearing as she is humble. 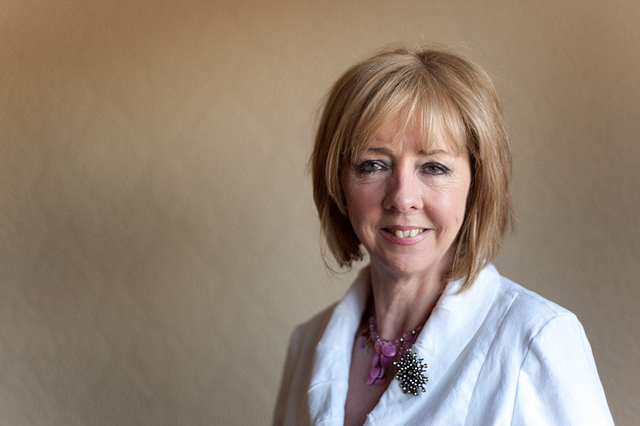 Mrs. Joan Freeman founded Pieta House, a centre for the prevention of self-harm and suicide in 2006. It is a service that was the first of its kind, a service that began a much needed conversation about suicide. Pieta House is the only organisation in the country providing a free, professional, face to face, therapeutic service for those in immediate affliction. Word spread fast from the beginning and soon the service was inundated with both those in need and supporters who wished to assist the new establishment. In just five highly successful years, they have helped over 12,000 people. Pieta began in Lucan but today there are centres in Ballyfermot, Finglas, Kerry, Limerick, Roscrea, Tallaght, Galway and Cork. So Mrs. Freeman, you have been a practicing psychologist for many years. Why did you make the move to set up Pieta house? There are many reasons, both personal and professional. While working in a private practice, I saw many suicidal or self-harming cases, which I would immediately send to a G.P. out of fear, and then I myself was personally affected by suicide. To be honest, it was guilt and feelings of helplessness associated with the loss of a loved that drove me to found Pieta House. I felt I needed to do something. What do you think makes Pieta different to similar services? There is no similar service to Pieta because we are there at the cliff-edge. It is a crisis intervention service that steps in when someone is thinking about or has attempted to take their own life. Pieta also differs as a patient does not require a referral from their G.P. Nor must the person make the phone call for themselves because sometimes someone in distress can not make that call. Why do you think suicide has become the epidemic it has today? Suicide can affect any one; they are not necessarily those who have been affected by a long-term mental illness. They may have led a totally ordinary life until they are faced with an unexpected or dramatic change, whether its work related, financial difficulties, the loss of a relationship or a death. Today, it is hard to remain mindful and therefore it is increasingly difficult to face personal challenges. It can happen to anyone. What is your opinion on the Irish attitude towards mental health? Although public attitudes on mental health have progressed slightly, there is still shame and embarrassment attached to not being okay, which can be seen in recent talks of new legislation to not state the cause of death by suicide on a death certificate. It is so important for numbers of such causes of death to be accounted for. There needs to be an ongoing conversation about suicide to remove the factor of shame. Also, the word ‘mental’ in ‘mental health’ needs to be replaced with ‘emotional’. The word mental is associated with crazy or psycho. But really a ‘mental’ illness is solely to do with the emotional difficulties. This word conjures up negative associations and that is why there is a ‘hush, hush’ attitude towards the problem today. What can Pieta do for a student that needs help? Everyone needs a structure, which can be very challenging for first year students in particular as life suddenly changes dramatically. It is quite unfair that young adults go from the very strict regime of the Leaving Cert to the un-routine life of college. This can be distressing. Pieta is a free service, which will talk through any problem a student may have which leads them to self-harm. We can help this person through talking, through compassion, respect and dignity. What does the HSE/government need to do differently to help people in crisis? The HSE is excellent; they provide Pieta with 10% of it’s funding per annum which amounts to €400,000. The HSE makes home visits to those who are simply unable to leave the home; they care and try their utmost to help those in need. Counselors within free services all over Ireland are crippled by the vast numbers of those in distress. There are simply not enough therapists to accommodate for everyone at present. Equally anti-depressants and other medications are being handed out too freely. Medications such as these can be wonderful and are more often than not, vital. Yet – it is also cheaper than undergoing therapy – it actually has the ability to make things worse rather than better for so many people. Unfortunately clamping down on the distribution regulation of such medicines seems to be an almost impossible task. What can the students of UCC do to help Pieta House? “We are supposed to feel sad.” We need to start a conversation so that people will begin to understand that it truly is okay not to feel okay. We need to raise awareness, from an early age so that young children grow up knowing about emotional illness. We need to identify what it is and then we will be able to identify it within ourselves. Pieta House has a ‘Mind your Buddy’ scheme which teaches the science of suicide. It only has to begin with one person but if this is passed on from one person to another, it will gain momentum and spread. Knowledge is power and it really is the knowledge in emotional health that will give both sufferers and their loved ones the power. What is your vision for the future of Pieta House? We currently have nine centres, but we are hoping to have two more opened in the next two years so that every one within Ireland is in a 60 km radius to our service. ‘Darkness into Light’ has been a huge success every year so far with walks and runs being held in the U.K, Australia and the U.S.A. We want to create a huge buzz around the event so that it raises awareness around suicide, what we are about and what we can do to help. The success of Pieta is achieved by those people who have the courage to come to us, as well as our supporters. 90% of funding is accumulated by fundraisers and is achieved by all of those who have great affection for the service. The ‘Mind your Buddy’ scheme hopes to reach out to large areas, such as schools, colleges, and large workplaces so that a dialogue begins. It is hoped that we at Pieta will be able to train people who are constantly on site so that there is always someone to reach out to should you feel the urge to harm yourself in anyway. This is the vital link needed between Pieta and the outside. What has the journey of seeing Pieta house grow meant to you personally? I almost feel as though I am watching from afar. Its success has been due to all the people around me and I feel like a bystander. Its success and growth has been down to the vast support of people all over Ireland and further afar, and for that I am grateful. I believe that prevention is the best cure and if we teach everyone how to cope and express themselves, we will see a rapid decrease in suicide. We’re changing the way people think of suicide and deal with suicide and that’s really exciting.